DTE Maharashtra MCA Admission 2018: The last date for registration of application and uploading of required documents is July 12. 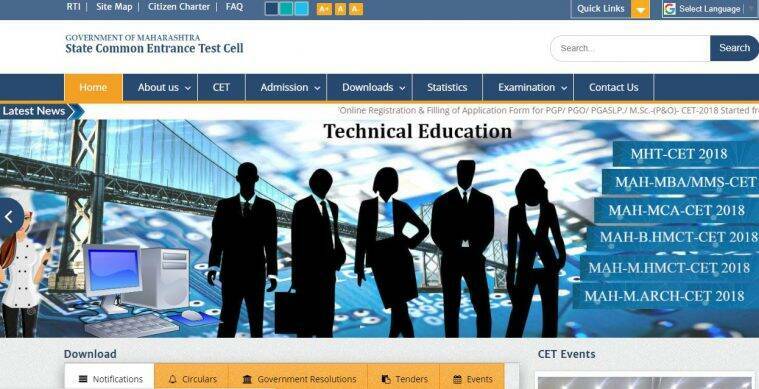 DTE Maharashtra MCA Admission 2018: The online registration for admission into first year/direct second year (separate division & lateral entry) in Master of Computer Applications (MCA) in the government, government aided, university managed institutes and unaided private professional educational institutes in Maharashtra has begun. Students should apply online at the official website — mahacet.org. The last date for registration of application and uploading of required documents (for Maharashtra state/all India/ J&K migrant candidates and NRI/OCI/PIO/CIWGC/FN candidates) is July 12. The provisional merit list will be out on July 13. Final merit list will be released on July 17. Details regarding the documents verification and application form confirmation at Facilitation Centers (FC) can all be found on the website. The result of MCA CET 2018 was released by the Directorate of Technical Education (DTE) Maharashtra on April 3. A total of 12,318 candidates had registered for the exam out of which, a total of 11,910 (96.69 pr cent) candidates appeared. — For Direct second year admissions, the aspirant should be holding a Bachelor’s degree in computer applications or science (information technology or computer science). To fill the CAP form, the candidates will have to first register on the official website. A login ID will be generated with which they can log in and fill the form. DTE Maharashtra charges Rs 800 application fee for general category, Rs 600 for reserved and PWD categories candidates from Maharashtra and Rs 5000 for children of NRI/PIO/OCI/Foreign National.